We all know people who love home decor, right? Maybe you are one of them. 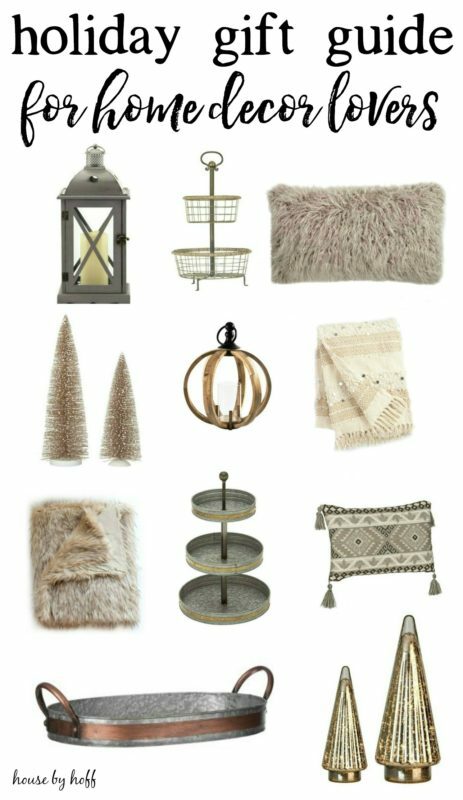 Well, as a self-proclaimed home decor expert I’ve combed the internet for my very favorite home decor pieces, and I’m super excited to be compiling them together and sharing them in my FIRST EVER HOLIDAY GIFT GUIDE! Whoot! 1) Give you some inspiration for some fun new pieces for your home. Some of these items are seasonal, and some are year-round appropriate. 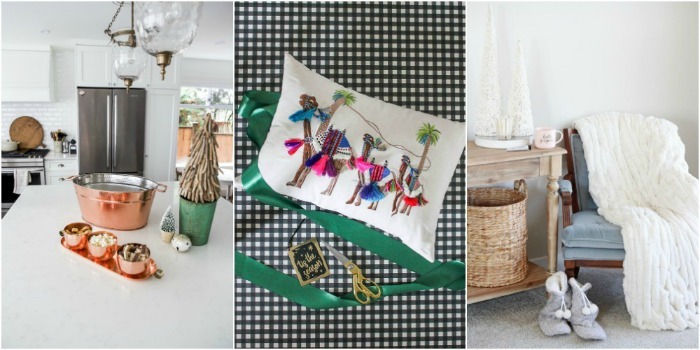 2) Help you out with some ideas for gifts for those home decor lovers on your holiday list. 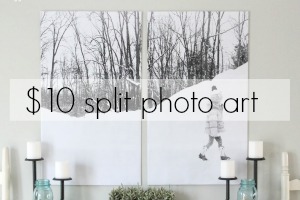 3) Show you how I am using some of the pieces in the gift guide in my own home. Ornaments and little holiday decor pieces make fabulous gifts for just about anyone. They’re a safe bet for coworkers and friends, and I’ve rounded up some neutral pieces that would go with anyone’s decor. 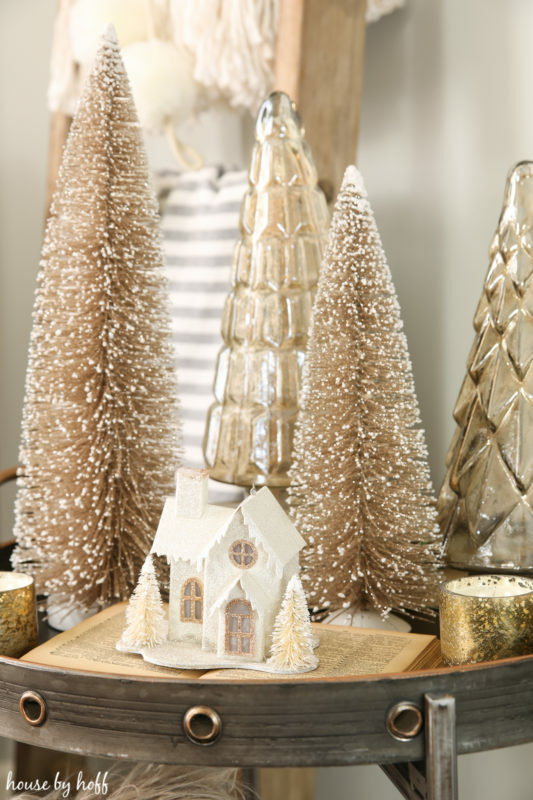 I’m really into these sparkly champagne bottle brush and vintage-inspired glass trees. They’re perfect for the mantel or on the table for a centerpiece. I’m also really loving these little white LED house ornaments. They look great on the Christmas tree, but I’m using them in little vignettes around the house this year. I don’t know about you, but where I live it gets cold. Like real cold. There’s really nothing I love more than to snuggle up on the couch after I put my kiddo in bed. Giving someone the gift of a warm throw or a great throw pillow is like gifting them a guaranteed cozy winter, right?! 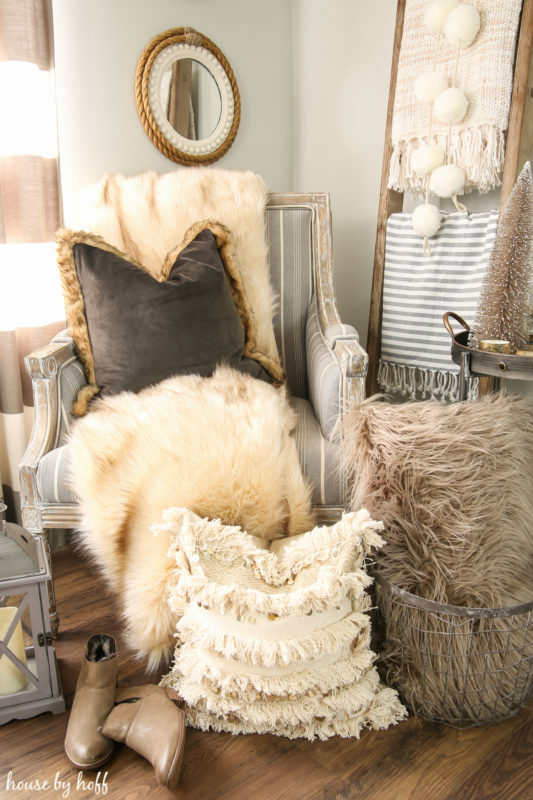 I’m really into faux fur this season, so this fun winter trend is popping up all over the house! 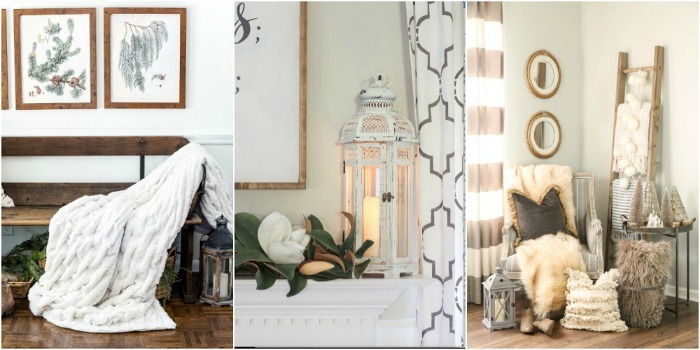 Nothing brightens up my home and gives it the feeling of warmth and coziness in the winter more than a lantern or candle. 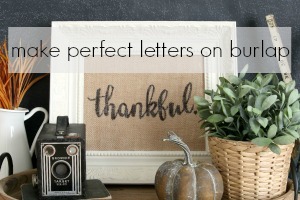 I love giving and receiving these kinds of decor items as gifts, and I think they’re universally pleasing to everyone! I don’t have any pictures of these beauties in my house, but man are they good! I had to include this category in my holiday gift guide, because EVERYBODY loves a good tiered tray or tray. I own #5 and use them all the time in my centerpieces and vignettes. 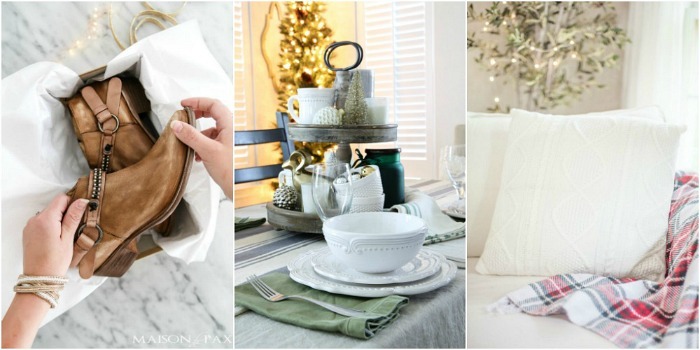 Decorating tiered trays and changing them out for the season is so fun too! The best part of the whole deal is that I’m not the only one posting a fantastic gift guide today! 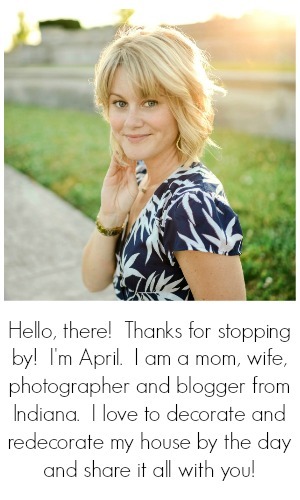 I’m teaming up with my very dearest blogging friends for a Holiday Gift Guide Blog Hop! Be sure to check out all of the fantastic gift guides below! Beautiful as always! 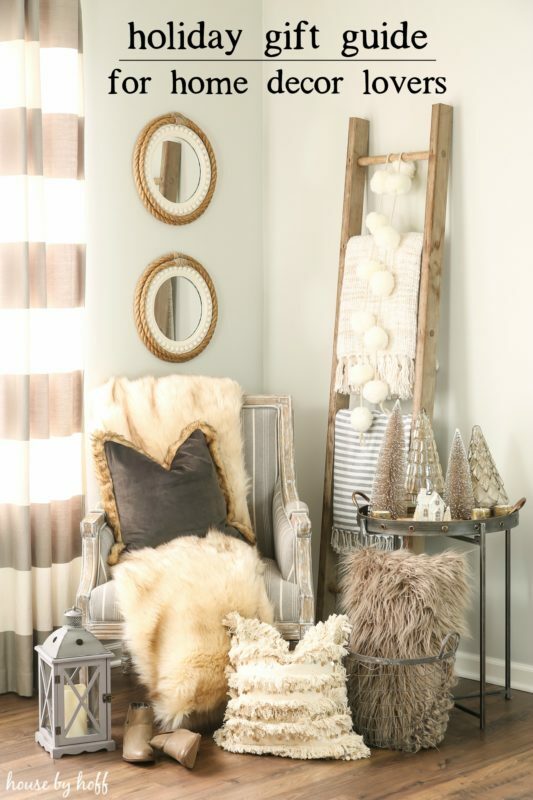 can’t wait to see how it all comes together for your holiday home tour. P.S I love the changes that you have made to the site. I love those Seychelle boots you picked, they look so worm and cozy. Darn it soft surroundings always taking my money, can you even have too many boots and blankets…. I love the champagne and neutral colors, you make everything look so elegant! And that Winter Bear throw is now on my wish list! It’s gorgeous!! I just bought new bedding from cariloha.com (don’t know if you’ve heard of them) and I was wanting to add some throws and I’ve been stuck to match colors but that faux fur pillow is a must for me now. Thanks for sharing these picks- you got me out of my rut!